Lava? Not quite. 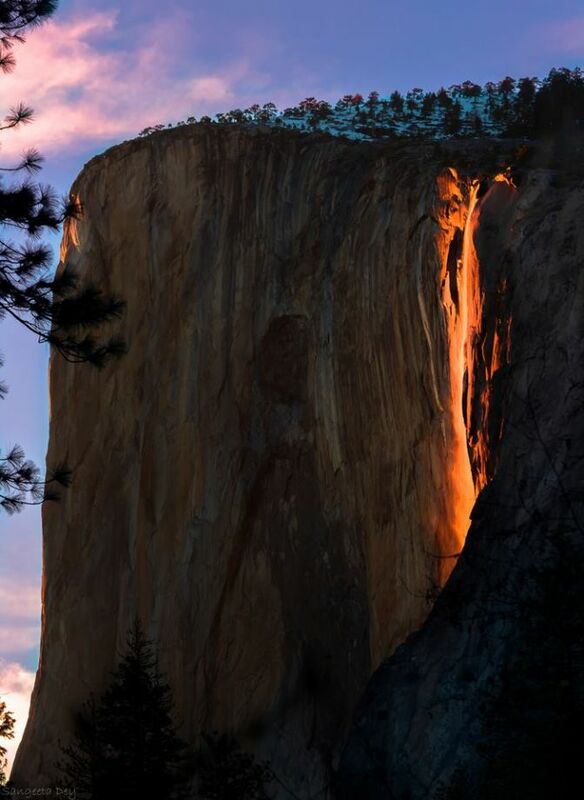 This photo is an example of a phenomenon called a Firefall in Yosemite that only happens two weeks out of the year. This is Horsetail Falls in Yosemite. Every year for two weeks in February, the sun sets at a certain angle and illuminates the waterfall in luminescent orange and red, making it look like a fluid fire. I’ve met photographers who said that they have been coming for 11 years only to see this happen 2 or 3 times. It was supposed to happen at around 5:30 in the evening, but I was there at 2 PM to find a spot. I finally settled for a tiny space under a thorny bush. When the fall started glowing, I couldn’t believe what I was seeing. For 10 minutes, all of us sat there mesmerized by this spectacle. When it ended, a few of us had tears in our eyes. Some of us were clapping. And others were just ecstatic to finally get a chance to see it after trying for years.